After besting the Sabres on Sunday, the Capitals took the 178 mile journey down to Pittsburgh to take on a depleted Penguins team. Much was up for the taking Monday night. With a win versus the Pens, the Caps could go finish their pivotal 5-game road trip above .500, move within a point of the Lightning for the Southeast lead and take the season series with Pittsburgh. But despite their injuries, the Penguins remained no slouch. Added with the motivation of playing a Washington team that defeated them on Feb. 6 and in the Winter Classic, the Capitals couldn’t take the Penguins for granted. And they didn’t. The first period, though scoreless, was certainly energetic. Both teams weren’t afraid to mix it up and play physical as the goalies shut things down. The Caps may have been outshot 18-7 for the frame but they were not without opportunities, including an Alex Ovechkin breakaway chance where the Great Eight was stoned by Marc-Andre Flurey. 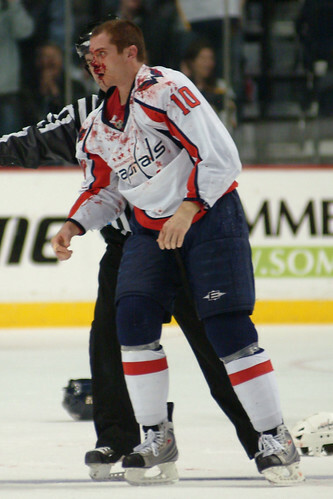 The fireworks really began in the second period when Matt Bradley delivered a huge hit on Capitals fan favorite Matt Cooke, receiving a charging penalty in the process. The Pens Jordan Staal proceeded to tackle Bradley to the ice as a scrum formed. Ryan Craig would ask Bradley to answer for the hit when the two dropped the gloves at 11:26 but Craig ended up getting the worst of Bradley’s fists. Shouldn’t Cooke be fighting his own battles? I don’t think I have to answer that one. And that would be it. Pittsburgh put 14 shots on Washington netminder Michal Neuvirth in the third period but Neuvy remained as solid as a brick wall. Shutout. World Peace. Something funny here. Caps beat Penguins, 1-0. After going 1-4 in their last five games — all against Western Conference foes — the Caps headed back to the friendly confines of the east coast on Sunday, hoping to right the ship versus Buffalo. Facing a hungry Sabres team in a nationally televised matchup, Washington was certainly up to the task. The first period may have been scoreless but it certainly wasn’t uneventful. The Capitals managed 16 shots but Sabres goaltender Ryan Miller was fantastic, making big saves throughout the frame. Washington also had four power play chances in the period, including over a minute and a half on the two man advantage. However, the Caps PP continued their struggles, failing to convert as Miller remained strong. Mathieu Perreault would finally break Miller’s streak in the second stanza. After an odd bounce in the corner, the puck kicked out to the front of the net. Perreault took advantage, putting the Caps up 1-0. However, after Brooks Laich was called for goalie interference, the Sabres would head to the power play. At 8:20 Jason Pominville converted on the man advantage, getting the puck past a screened Semyon Varlamov to knot the score at one. Midway through the third, former Cap Shaone Morrisonn was whistled for interference, once again putting Washington on the power play. But this time, it actually worked. Alex Ovechkin skated the puck into zone before firing a shot on Miller who made the stop. However, the biscuit went to waiting Perreault. With a little help from Marcus Johansson — whose deflection awarded him the marker — Perreault put the puck in the back of net, giving the Capitals the lead. Buffalo attempted a rally but Varlamov stayed strong. Caps beat Sabres, 2-1. In honor of Valentine’s Day and to drown your sorrows after the latest Caps loss, we asked our readers to submit their very own cards addressed to a Capitals player. And oh, boy, did you listen. We’ve included many of your submissions but have narrowed it down to five finalists. From there, you guys will vote to pick the winner, who will receive one of our lovely — no pun intended — t-shirts. Voting will last until Wednesday night at midnight. And FYI, some of these cards may be NSFW. Proceed with caution! Matt Bradley does his part by pushing a kid around on a sled. Today, the Capitals teamed up with Dreams for Kids for Extreme Recess Hockey. Caps Matt Bradley, Tom Poti, Dave Steckel and coaches Bruce Boudreau and Bob Woods took to the ice after practice and skated with children with physical and developmental disabilities. For some of the kids, today’s skate was the first time they had ever played hockey or even shot a puck. Britt McHenry of ABC7 was on the scene at Kettler and had a chance to speak with some of the participants including Connor, who had the chance to skate with some of his heroes. The Caps may have had trouble scoring lately, but on Saturday afternoon players were racking up scores by the hundreds. Then again, the game was bowling. Karl Alzner, Matt Bradley, Jason Chimera, Eric Fehr, Boyd Gordon, Matt Hendricks, DJ King, Mike Knuble, Jeff Schultz, David Steckel, Brooks Laich–plus their wives, girlfriends, and children–took part in “Bowling with the Caps” at Lucky Strike Lanes in downtown DC. The event was all for charity, raising over $60,000 for the Chris Walsh Cancer Survivorship Fund at Virginia Hospital Center. There was a zeitgeist surrounding the Washington Capitals’ visit to the Tampa Bay Lightning’s playground. The words we kept hearing were “must win,” which is great motivator even if it’s not objectively true. Still, the Caps seemed to take it to heart, bringing an effort to the game that reminds us– above all else– of the ’09-’10 version of the team. Not bad. Red-hot Teddy Purcell scored on Tampa Bay’s first shot of the night, a 40-foot slapper to Varlamov’s weak side. On a 4v4 sequence that we’ll discuss later, Nicky Backstrom used some stick-to-it-iveness to even the score from the crease. Brooks Laich (!) piled on with a wizardly backhand top-shelfer set up by Mathieu Perreault. Alex Ovechkin put the visitors up 3-1 with his long-delayed return to the PPG stat column. Tampa’s Brett Clark kept the second period busy with a retaliatory powerplay tally. The third period found Nick Backstrom cleaning up an Ovechkin crash for his second of the night, and Jason Chimera recording an empty-netter. Caps beat Bolts 5-2. Wings, MFers. To all our friends stuck on the roads during this crazy #thundersnow storm, safe travels. Don’t do anything I wouldn’t do. So the final game for the Washington Capitals before the All-Star break found them meeting the Atlanta Thrashers in the not-so-balmy temperatures of Georgia. It did not go well. Nik Antropov settled a lucky bounce in the Caps zone, leading to an easy goal against Semyon Varlamov. That was it. No other goals. Shutout for Ondrej Pavelec. Thrashers beat Caps 1-0.